Humanity’s relationship with bamboo is extensive, stretching across a myriad of cultures and spanning thousands of years. Its uses have evolved over time, and even in the 21st century this grass—considered a symbol of fertility in Chinese culture and a symbol of friendship in India—has been utilized in a multitude of ways that might seem a tad eccentric, especially by North American standards. These 19 uses of this sustainable plant highlight not just its versatility, but the ingenuity of the human mind as well. Many of us have seen the bamboo flutes from Kung-Fu episodes, or the great pipes commonly associated with the Greek god Pan, but have you seen bamboo speaker cabinets? The tan hue of the bamboo gives speaker enclosures a rustic look, and are a perfect complement to conventional black speakers. Although mostly associated with the wind instruments, bamboo is used to construct a variety of percussive instruments. 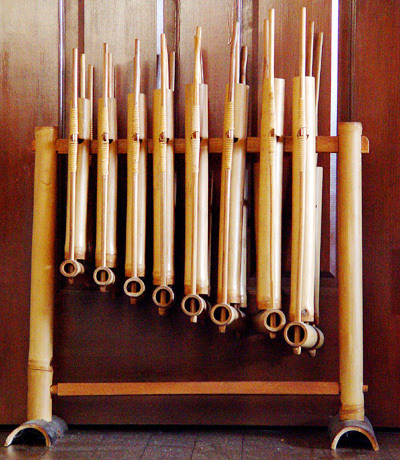 Examples include the xylophone and the angklung—an Indonesian instrument comprised of tuned bamboo tubes on a bamboo frame. The instrument is shaken and struck at the same time, creating a percussive and tuneful sound. Given its durability and strength, bamboo is an easily workable, light and extremely stable building material. It is an exceptional material that withstands large amounts of weight, making it suitable for footbridges in rural settings. One such example is the Kampong Cham bridge in Cambodia, which connects two islands in the region and holds the distinction of being the longest bamboo bridge in the world. Across the water the Japanese rely on bamboo as a main building component. There footbridges made with bamboo planks and binding materials span chasms and river systems to enable the travel and commerce of locals living in remote areas. Bamboo is renowned for being a highly sustainable material, because it grows very quickly in moderate to poor soil conditions—some varieties can grow up to a foot a day! And because harvesting the plant results in little to no damage of individual stalks. Another ‘green’ use of bamboo is as a building material for alternative energy installations. In many rural settings, like this one in Yangshuo, China, bamboo is a primary material for building waterwheels for hydropower. Bamboo is also used to make blades for wind turbines. While it is not advised that you take a newly sharpened knife to a floor constructed of bamboo, if you did so you would discover that the knife, much like those hocked by inventor and marketing guru Ron Popeil, would likely remain sharp. As a result (however indirect it may be), bamboo cutting boards are a hot item in personal kitchens. Aside from helping knives stay sharp, bamboo cutting boards are incredibly stylish and much easier to clean than typical plastic cutting boards. Bamboo is a popular material for traditional Asian kitchenware as well. For instance, bamboo steamers have been used in Asia for centuries to cool rice and steam vegetables, but have more recently made their way west and bring an elegant, healthy way to steam—rather than boil vegetables—preserving their flavor. …Or dinner, for that matter. Don’t let its tough exterior fool you, bamboo shoots have been a popular food staple in Asia for centuries. Utilized in stir-fries and served fresh, dried, shredded, pickled, braised, and (Yum!) curried, bamboo shoots (the emergence of a new bamboo stalk) are considered a delicacy in the Coorg district of Karnataka, India. If you decide to eat bamboo shoots, be careful! Some species contain cyanide, and require proper preparation to be consumed. Despite its myriad of uses within the culinary world, it’s safe to assume that bamboo’s most appropriate use is in making bamboo beer. Eschewing traditional grains like barley and hops, beer made with bamboo offers a unique flavor suitable for your bamboo-derived repast! Making bamboo beer requires a process of fermenting the rich natural sugars of the plant’s sap. This beverage is naturally enjoyed in Asia where bamboo is plentiful, but is also found extensively in Africa, though only during rainy seasons. With a little ingenuity and some handy Google skills, one could conceivably find a way to have a cold, frosty case of bamboo beer imported to their front door. Forget Arm & Hammer baking soda! When you’re putting away the leftovers, you’ll find that bamboo charcoal is a versatile material used for air freshening. When finely ground and contained, it naturally kills odors in refrigerators and other small places such as closets or cabinets. This is an image of a Chikuno cube, a Japanese counterpart to the boxes of baking soda commonly found in refrigerators throughout North America. In addition to odor-absorption, bamboo charcoal also acts a dehumidifier. Many ingredients used in beauty products can be intimidating (such as placenta), but those concerned with simple aesthetics can forgo the disturbing in favor of skin exfoliants made from bamboo charcoal. When heated, bamboo charcoal is made into a medicinal vinegar, used in places like Japan to treat minor skin conditions like eczema. Bamboo products like this are also known for anti-bacterial and anti-fungal properties. Not content with only making your skin beautiful, bamboo wants to make your clothing beautiful as well. Bamboo has become a popular choice in durable, air permeable, soft fabrics, and is used in to make bedding, underwear, baby diapers, blankets, bags, hats, and much, much more. Just to be clear, the nightie is made of bamboo—not the shoes. But given the versatility of bamboo, would it be surprising if they were? In addition to serving as a building material for a variety of musical instruments, bamboo’s uses extend to the visual arts. Common examples include bamboo brushes, drawing implements, and materials used prominently in sculpture. Artwork created with or from bamboo is still very much part of a living tradition and practiced by cultures throughout the world. In the earliest Asian civilizations, bamboo ‘slips’ were regularly used as writing surfaces. The Art of War by Sun Tzu was composed on a bamboo slip in the 6th century. A slip is a tablet read vertically down the bamboo stalk. For all you femme fatales and tobacco aficionados out there, bamboo plays are role in smoking paraphernalia too. Bamboo was used to make the cigarette holders popularized by film-noir auteurs and hard-boiled detective stories since the 1920s. Although not the healthiest use of the popular plant, the impact bamboo has had on the visual style of this era of history cannot be denied. In addition to fashionable cigarette holders, bamboo rolling papers are also a popular item among the ‘roll your own’ crowd. You wouldn’t think it, but the durability of bamboo makes it an ideal protective covering for your noggin. While the notion that the only thing protecting your head from becoming permanently embedded in the asphalt below you is a carefully constructed piece of grass might be bamboozling, this bamboo motorcycle helmet passed E22-05 safety standards in the UK. Not only that, it’s way more stylish than plastic, don’t you think? Bamboo bikes are a union of natural material and a highly innovative industry. To manufacture these products, bike frames can literally be grown, with the shape of the stalks manipulated and formed into a variety of styles using a method not unlike that of pruning a bonsai tree. The use of these bikes is widespread. They’re found predominantly in Asia and Africa, but are gaining popularity in North America. The development of bamboo bicycles led to a number of programs that supply such bikes to developing nations. This affords greater mobility to residents of remote areas and helps improve their quality of life. Bamboo bike projects also allow people to build their own bamboo bikes, using locally sourced bamboo. Not one to ignore the plant’s versatility, engineers and scientists at Kyoto University in Japan have utilized bamboo in the construction of electric cars. Although not the most aesthetically pleasing vehicle, this Kyoto bamboo electric car is representative of the evolution of an emerging industry now highly dependent on plastics. Bamboo is not only durable, but recognizable as well, if want to try your hand at building novelty cars—perhaps implementing a ‘South Seas’ theme like this one—bamboo bodywork is clearly the logical choice. This one runs on coconut oil, too. Move over Gilligan! We’re unlikely to see bamboo cars on the highway anytime soon, though you never know what the future may hold and in what form a bamboo-based eco-friendly car may take. The use of bamboo for aesthetic purposes seems ideal within the world of computers. Given its rustic look and durability, bamboo has been used to enhance computer hardware, making it more than just monochromatic pieces of plastic and metal. Bamboo is used for hard-drive cases, keyboard covers, computer mice and other types of computer hardware. Bamboo is symbolic here too, reflecting the green design of the new Asus, but many cases of Fujitsu brand prototype laptops have been constructed of solid bamboo rather than just a veneer, making them more biodegradable. In the meantime, however, bamboo fibers are used in packing material for Dell computer equipment, bringing the computer hardware industry one step closer to a greener future. Bamboo is used extensively throughout the world as an inexpensive, plentiful and sustainable material in a variety construction projects and scaffolding is no exception. The strength and durability of the plant easily bears the weight of workers, their tools and other materials. Bamboo has incredible tensile strength, meaning that it can withstand significant amounts of stress and is comparable to steel’s tensile strength. While the use of a natural material to aid in the construction of large-scale construction projects throughout the world may seem strange, one only has to look as far as China, where bamboo is used in much the same capacity as steel is in North America. It comes as no surprise that bamboo—difficult to break yet easy to bend—is commonly used in the construction of fishing poles. But did you know that bamboo is also used as a support for large fishing nets? In what serves as just another example of bamboo’s incredible versatility, nets are hoisted via an elementary pulley system, using long bamboo poles to manage the great stress that comes with snagging hundreds, if not thousands, of fish below the water. In some rural settings, such as those found in places like Vietnam, bamboo is used in the construction of fishing boats, too. The boats are small and maneuverable, allowing fishing to take place in narrow areas where commercial vessels typically can’t go. This allows the fishermen to deliver their hauls directly to shore. They are incredibly sturdy, thanks to the durability of their bamboo hulls. You might say that bamboo is the go-to material to the fishing industry—tough, water-resistant, easily workable and light. If you’re interested in folk dancing from the Philippines and from Myanmar, expect bamboo to be very much part of the proceedings. The Chin bamboo dance from Myanmar (formerly Burma) involves a group of participants who kneel on the ground, creating a crosshatch of bamboo stalks. As they open and close the gaps, dancers move their feet between the gaps. In the Philippines, a similar dance called tinikling tests the coordination (and bravery) of the dancers by clapping bamboo stalks together while the dancers perform the steps, avoiding the bamboo stalks. Both of these dances clearly reflect the skills of the dancers, the use of bamboo as a primary element of traditional dance also speaks of the geography of the country and how it is directly connected to the cultures of the participants. Bamboo swords and staves (a long stick or staff) have been used for thousands of years—as training implements in the kendo tradition of Japan and in India bamboo staves are constructed for stick fighting, a form of martial arts training. These traditional disciplines and the use of bamboo weapons remain alive today. Just like as used in fishing poles, bamboo is a trusted material for making bows and arrows due to its strength and ability to bend without breaking. In the South Seas, bamboo blowguns and darts were staples of indigenous hunters and ancient Samurai warriors utilized bamboo to construct the hilts of their katana blades. Even the scabbards for the weapons were constructed from bamboo. The tradition of using bamboo to construct and use weapons persists today, and remains a primary construction material. Once you’ve shuffled off this mortal coil and stopped enjoying the many uses of bamboo, you can spend the rest of your days six feet under in it. No ifs, ands or buts. The penultimate culmination of bamboo’s contribution to the green movement is bamboo caskets. Sturdy and presumably far more inexpensive than standard caskets, bamboo is biodegradable, making it one of the greenest ways to spend the afterlife. For all your bamboo and natural material decor and building requirements, go to www.bamboo4.co.za– agents for Brightfields Natural Trading Company, South Africa (suppliers of bamboo cladding, bamboo fencing, bamboo decking, bamboo rugs & carpets, bamboo boards and sisal & seagrass products) Water Rhapsody Mpumalanga supplies and installs high quality water conservation systems and water-saving devices, including grey water recycling systems and rainwater harvesting systems and tanks (see product demo) and we are authorized JoJo Tanks dealers (full range of water- and chemical tanks and tank stands can be ordered). Contact us for a FREE QUOTE.